By Chris Williams: Golden Boy Promotions head honcho Oscar De La Hoya says he thinks Manny Pacquiao’s 23-year pro career could be coming to an end this month in two weeks from now when he challenges WBA World welterweight champion Lucas Matthysse (39-4, 36 KOs) on July 15 at the Axiata Arena in Kuala, Lumpur, Malaysia. 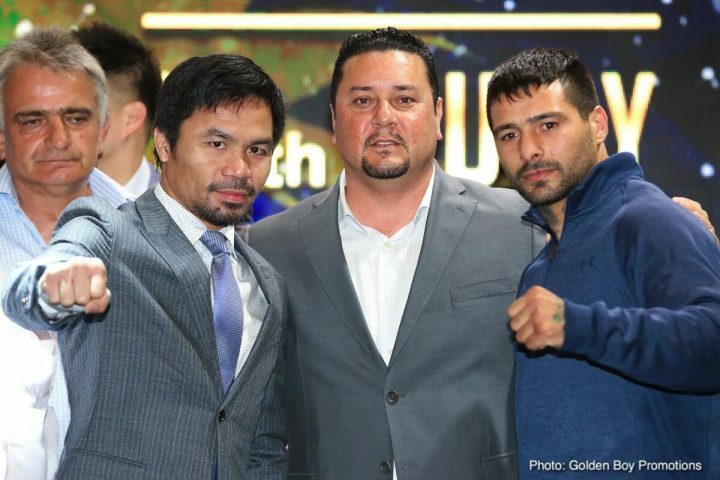 De La Hoya confirms that the Pacquiao vs. Matthysse fight will be taking place on July 15. Pacquiao’s former promoter Bob Arum of Top Rank has doubts whether the fight will take place. De La Hoya says it will happen, and he sounds confident. Pacquiao, 39, is coming off of a loss to Jeff Horn last year in July, and he’s been out of the ring for an entire 12-year pro career. Pacquiao (59-7-2, 38 KOs) looked terrible against Horn, and he’s not likely going to be any better against Matthysse. Pacquiao’s year out of the ring since the Horn fight is troubling because that’s not the type of preparation that you’d like to see from the Filipino star going into a fight against a devastating puncher like Matthysse. Pacquiao is no longer trained by Freddie Roach, and that’s definitely not a good thing because he’s been the brains for him during his career. Pacquiao is now trained by his former helper Buboy Fernandez. One can only guess what kind of simple game plan Fernandez has come up with for Pacquiao to defeat Matthysse. Pacquiao is likely going to go straight into the teeth of Matthysse’s offense in the same way he did against Juan Manuel Marquez in their fourth fight in 2012. Matthysse has a good chance of knocking Pacquiao out just like he did his last opponent Tewa Kiram last July. “For me, every legend has its end and I think that this fight with Matthysse may be the end of Pacquiao,” De La Hoya said to ESPN Deportes. Well, if Pacquiao loses by a knockout to Matthysse, it leaves him very little choice but to retire from boxing unless he wants to push for a rematch. I doubt that Matthysse is going to want to bother fighting Pacquiao a second time, as he’s going to have other options for nice paydays against the likes of Errol Spence Jr., Keith ‘One Time’ Thurman and the winner of the Shawn Porter vs. Danny Garcia. Pacquiao will need to get in line for a rematch with Matthysse if he loses to him on July 15, and that’s going to look pathetic in the eyes of a lot of boxing fans. “ESPN is supposed to broadcast it (on US soil), I’m going to Malaysia on July 10 to be with Matthysse and Pacquiao, that fight is going to happen without any problem,” said De La Hoya. It’s good that De La Hoya is saying the fight will be taking place, because this is important match for both guys. Pacquiao has no chance against the other top welterweights Keith Thurman, Spence and Terence Crawford. Matthysse is the only guy that Pacquiao has any chance of beating, and if he can’t do that, then it’s time to retire from boxing. If Pacquiao needs money, then of course he’ll have to keep fighting to bring in the cash, but hes going to need to be selective in the fights that he takes. The fans will stop watching Pacquiao if he keeps getting beaten and if takes a year off between each loss like he did after his loss to Horn.